Interfaculty Initiative in Information Studies (III)Toppan Printing Co., Ltd. This project is involved in the development of infrastructural ubiquitous computing technology, analysis of the effects of such technology on society, and investigation of ways to establish and systematize basic knowledge. This project is concerned with ubiquitous computing infractural technology and social innovation based on the use of such technology. 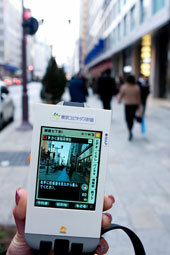 It was begun in October 2007 and is supported by a grant from Toppan Printing Co., Ltd. Since it will form the very infrastructure of the information society, ubiquitous computing technology is sure to become an indispensable support for our life in the future. In contrast to existing Internet-based information technologies, ubiquitous computing does not construct a digital virtual world. Instead, it will support our society by being directly embedded in the real world. It is therefore very closely related to real-life activities and the diverse cultures that underlie these activities. A new information society will be born through the interconnection of information with the real world. This project is engaged in the development of ubiquitous computing systems and the analysis of their social impact. Technological development alone is not sufficient to realize a functioning ubiquitous computing environment. It is necessary also to reach a social concensus about information discernment and structures, including the establishment of standards and social investment in infrastructures. By conducting research on ubiquitous computing technology and its relation to society, this project aims to establish and systematize a new field of basic knowledge to provide the foundations for the ubiquitous computing information society of the future.